Do you ever wish you could move a table, chair or sofa yourself, without relying on your partner, neighbor or friend to help you move it? Sometimes you just want a change and feel like trying a different furniture configuration without a hassle, or you want an easy way to vacuum underneath an item. This is where casters can help. 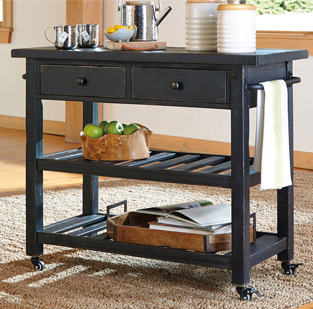 From discreet mini casters on a shiny bar cart to large, industrial cast-iron wheels on a distressed wood table, you can make rearranging furniture easy and stylish. Make it Multifunctional || Suppose you need a new cocktail table for your living room but frequently use the room's sleep sofa for visiting guests. A table with casters is the ideal solution. You just wheel it out of the way when you set up your sleep sofa. Or, if you like to entertain guests in the living room, but during the holidays, the dining room holds more people, a bar cart on casters will be the perfect multitasker. Work in a Rustic Element || If you like the vintage industrial look of rustic pieces but don't want to incorporate a total factory into your home, an accent piece on casters is a great solution. Place a multi-drawer console with casters in a home office, for example, and it will add character to your space, and work smarter by giving you more flexibility. An office chair on casters will be an asset, too, and a rich, leather upholstered one can add a warm rustic element to the room. Roll it This Way || First patented for use on furniture in the 1800s, casters were originally made of metal. Today, you'll find casters made of myriad materials, including metal, plastic, glass and rubber. In addition, there are different caster types. In general, rigid casters (like the back ones on a shopping cart) will allow you to move the item forward and backward, and swivel casters (like on many office chairs) let you move the item 360 degrees. Some items feature locking casters, which are especially important on heavier furniture for safety.